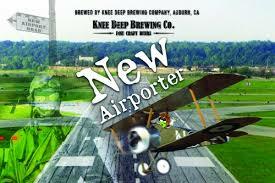 “New Airporter” is a play on words giving tribute to the location of our production facility in Auburn, at 13395 New Airport Rd. This American Porter is Chocolatey and smooth, and gets straight to the point with a low hop bitterness, and a rich, luxurious, mouthfeel. No artificial flavors or adjuncts in this elegant take on the traditional American Porter. Best enjoyed next to a fire, on a chilly winter evening.